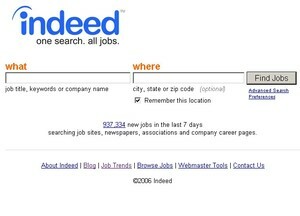 Indeed is the best general job site for active job search today. Period. Yes, I know; if one site fit every need, there wouldn’t be 30,000 to 40,000 job boards. Some sites are best for special niches (TheLadders and Dice are great), there are sites that are best for passive job search (Monster’s strength), and there are sites that focus on the social networking side of job search (check out Jobster and TheLadders) – we’re fortunate to have so many great options. The fact remains, for active job search, where broad coverage of the job market is most important, only Indeed combines the highest coverage rate with powerful search plus a great set of supporting services. Makes sense really, that the site with the tag line “one search. all jobs” provides the best overall coverage in this comparison (see the initial post in this series for methodology). With 86% coverage, Indeed matches JobCentral, the 2nd place site. And if the sites were otherwise similar, this comparison would have ended in a tie. They’re not, and it didn’t. Whereas Indeed returns all search results in ‘organic order’ – the best matching jobs listed first no matter where they come from – JobCentral lists jobs posted by their member employers first, even if non-member jobs are a better match. Whereas Indeed displays all matching ads for each search, JobCentral users don’t see 90% of the job ads (the non-member ads) unless they click a separate tab after each search. Whereas Indeed shows a brief description and date for each job ad, JobCentral shows neither. Data quality is also a plus in Indeed’s favor. To match Indeed in coverage, JobCentral adds content from SimplyHired (the 3rd place site) – past comparisons have found SimplyHired includes more duplicate and closed ads in their data. Throw in the bonus of a rapid innovation curve, delivering a plethora of cool features that support the job search process (e.g. interactive job trends, email alerts, rss feeds, custom tagging, plus integration with LinkedIn and Ryze) and Indeed is clearly the best general job site for active job search. Congratulations Indeed! How do you define 100% coverage? Thanks a lot for your review, Bob. Since Indeed was launched in 2004, our philosophy has been to put the job seeker first, to give job seekers the best possible job search experience, and we continuously improve our service in our goal of providing the most comprehensive and relevant job search results. It's great to have had that acknowledged by Job Search Engine Guide! 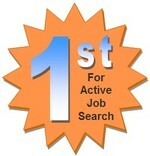 http://www.indeed.com - one search. all jobs. As mentioned in the original post in this series, evaluating coverage is a challenge. Vertical search sites (e.g. Indeed, Jobster and SimplyHired) try to find all of the available job ads; yet, these sites vary significantly in the number of ads they report for a common geography. Variances in search algorithms, meta-data assignment, and handling of duplicate records all complicate the comparison process. Add in the speed at which job ads open and close, plus the rapid rate of change in technology behind the sites, and it becomes critical that the methodology used to compare coverage between sites constrains the scope to allow rapid turnaround. For this comparison, Eugene, Oregon was selected as the home to a hypothetical job seeker. With a population of roughly 150,000, Eugene is large enough to have its own Craigslist site, isolated enough from other cities to minimize the effects of variances in geographical classification, and small enough to provide a manageable number of online job ads for comparison between sites. Each of the 10 job sites in this comparison then contributed 5 job ads from the Eugene area to a test sample of 50 jobs; no duplicate or closed ads were allowed in the sample. Each job site was then searched for all 50 jobs, and a ‘coverage score’ was calculated. The minimum possible coverage score is 10% since each site contributed 5 of the 50 job ads in the test sample. The hypothetical job seeker in this test is looking for the site containing all 50 jobs (100% coverage). Are Job Boards in Denial?